What with me becoming a member of three different DT's I realized that I really need a wall calendar, where I could write in all my assignments and other important things. I also had an image of one quite interesting desktop calendar, where TH small knobs were used to hang calendar pages. So I took that idea and went crafting :) It was so wonderful that my very first task over at Frosted Designs Fabulous Friday was numbers. What better match could there be? 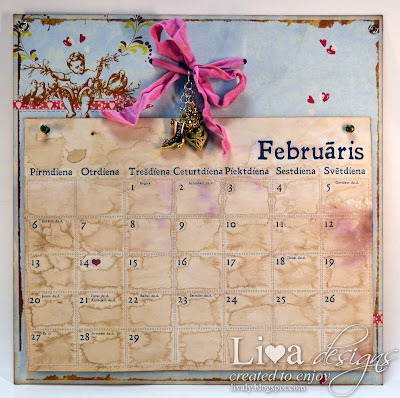 I have glued K&Company patterned paper on sturdy chipboard base and added eyelets in top corners which I use to hang my calendar. I also printed my self designed calendar pages on simple office papers, that I had soaked in Tsukineko Walnut Ink water solution. 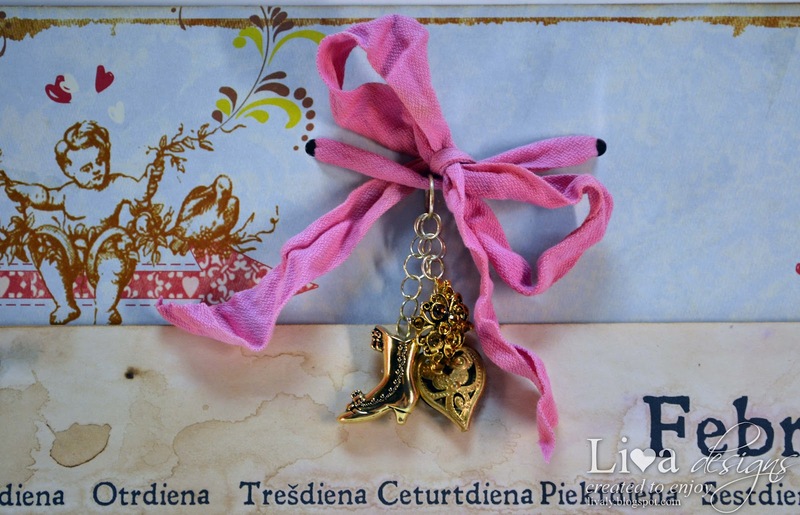 For a little girly accent, I added this scrunched seam binding and few metal charms - nice vintage boot button, filigree heart and top of an old and broken earring I found. 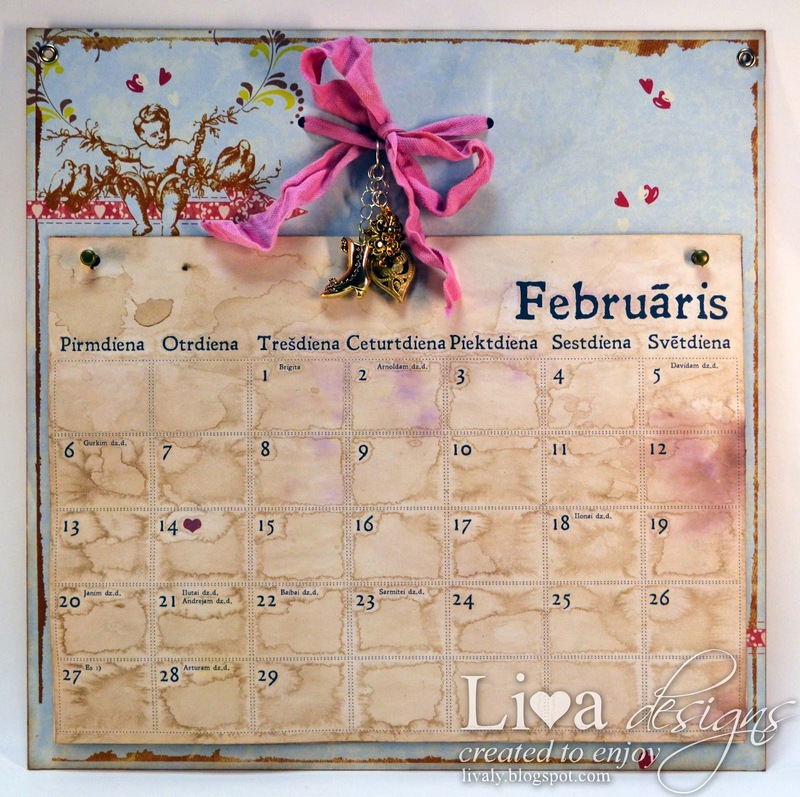 I love, love, love your calendar! It is so beautiful I am not sure I would be able to write on it!! What a gorgeous decoration for any office space! Welcome to the Frosted Designs family! I have to agree with Barb, your calendar is gorgeous and I also don't know if I would want to write on it! Welcome to Frosted Designs! We're excited to have you on the team! Welcome to our little family!!! Your calendar is beautiful! I love the charms. Welcome to the FD family! I, too, have a calendar for all of my deadlines, but it is NO where near as pretty as yours!!! I love how you colored your own paper!! Awesome! Without a doubt, one of my favorite inspiration pieces for 2012. Thanks Liva! Who dare write on such a beautiful creation! Gorgeous! New to FD family so am making the rounds today becoming a follower.